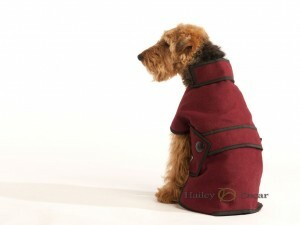 Kit out your pooch in this lovely British designed wool mix coat that is unbeatable for quality and attention to detail. A fleece lining keeps your dog warm and comfortable when braving the British weather, with a large inner pad of surcingle for extra heat. This classic coat is also machine washable, making it a wonderfully practical piece of clothing for your pet that doesn’t compromise on style. Large pad of surcingle to keep the dog warm. Forward folded collar to keep the neck warm, and make your dog looks cool. measuring from the neck to the root of the tail.